Florida’s farmers are stewards of 9.45 million acres of land and responsible for $4 billion in agricultural commodities exports. Our farmers are facing the challenge of meeting produce demands while conserving soils, supporting water quality, minimizing water usage, and protecting landscapes. The Conservancy works closely with many members of the agricultural community to help ensure best management practices are implemented to support conservation. On March 2, 2017, Conservancy partner and farmer Gary Reeder and his colleagues at West Coast Tomato were honored for their environmental stewardship and received a national 4R Advocate award from The Fertilizer Institute (TFI). 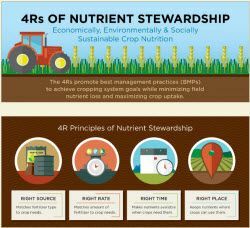 The 4R Nutrient Stewardship program promotes practices for sustainable and effective fertilizer use, focusing on the "4Rs" — the right source, right rate, right time, and right place. Reeder’s family has farmed the same land for 45 years, and he has been implementing practices aimed at efficiently using nutrients and water even before the 4R program had its name. Growing spring and fall tomatoes requires great volumes of water and careful management, and the farm’s highly efficient irrigation system allows water usage to remain below permitted water allotments. Through best practices and constant soil testing, the right nutrient decisions are made and quality plants are grown, limiting nutrient loss. Winners will receive an expense-paid trip to the 2017 Commodity Classic, "America's largest farmer-led, farmer-focused convention and trade show", where they will be honored at an awards banquet hosted by TFI.